I whipped up this simple recipe last night for dinner. 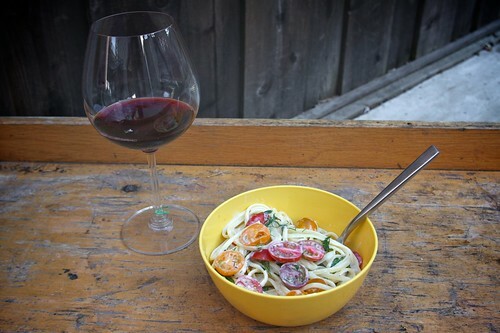 We ate large bowlfuls outside on our back patio with some scrumptious red wine. What I like about this dish is that the heat of the pasta melts the goat cheese crumbles, making a creamy & tangy sauce. 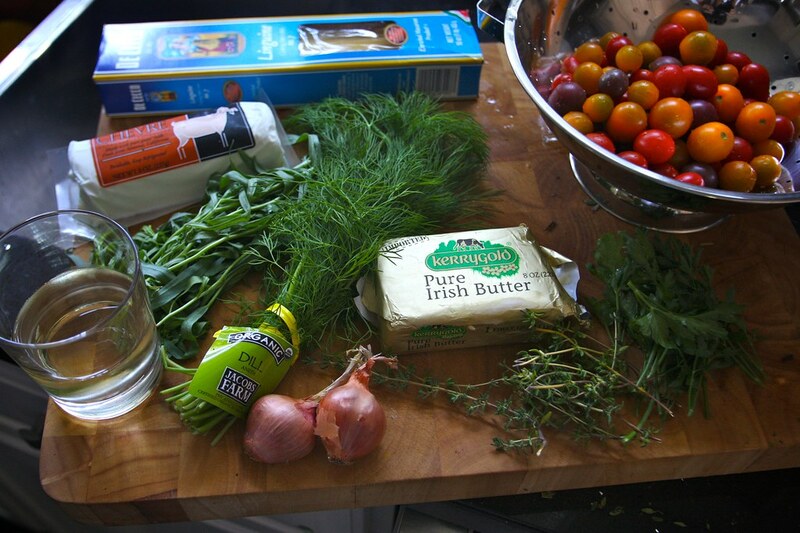 I also love the simple, yet complex taste of the fresh herb mixture paired with the buttery wine sauce & sweet heirloom tomatoes. 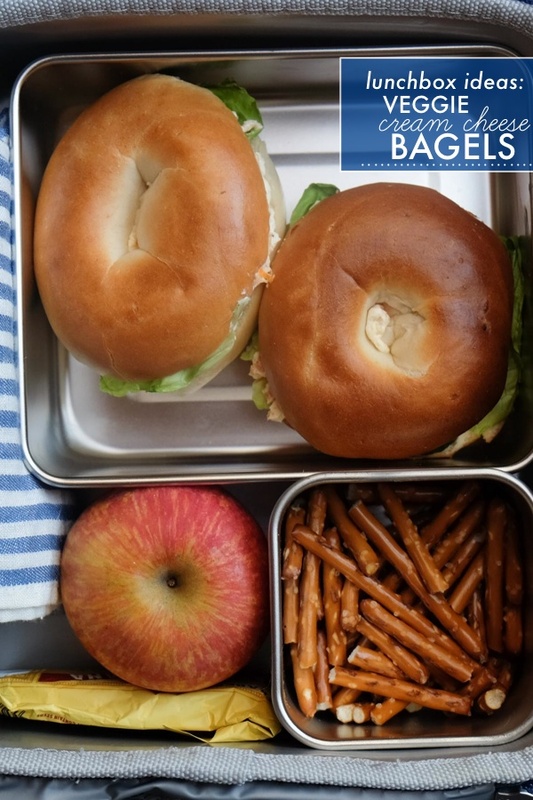 It’s tastes light AND rich at the same time. How is that even possible? The dangerous part is that it’s hard to stop eating the pasta. 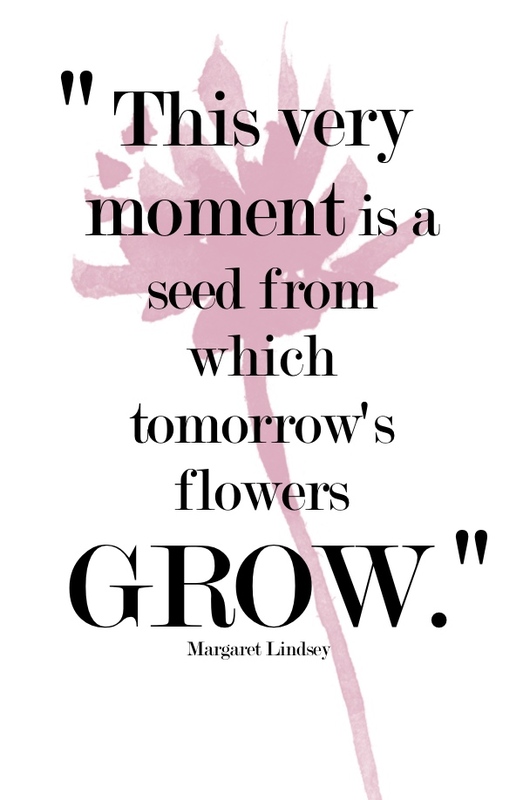 Perhaps, you’ll see what I mean…. Introducing the Herb Quartet! 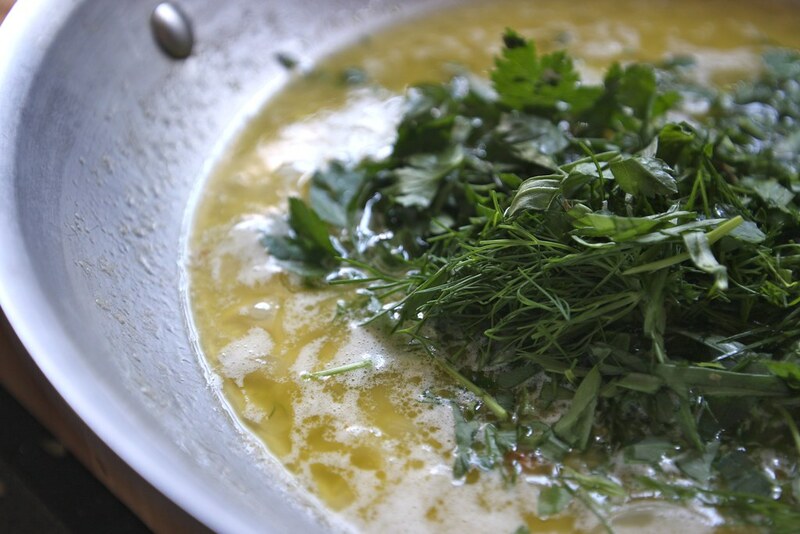 Tarragon, dill, parsley & thyme. Melt the butter in a pan. Add shallots and cook until soft/translucent. 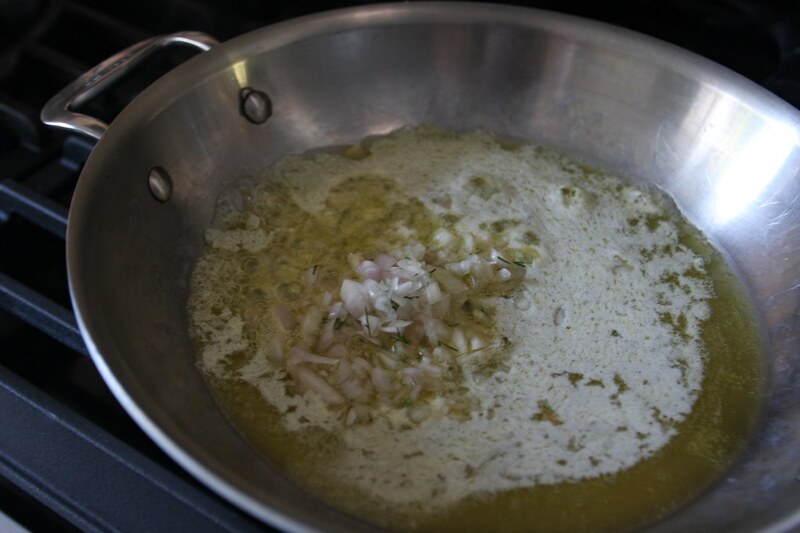 Once the shallots are soft, add your white wine and reduce for a couple of minutes. 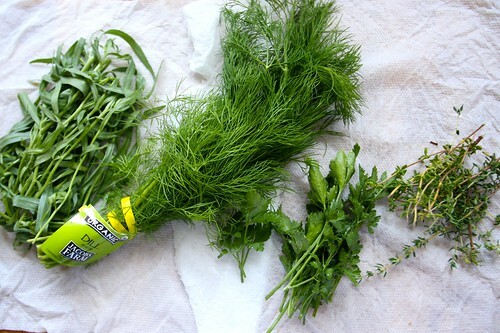 Chop up all your herbs! Crumble the goat cheese. Chop up your tomatoes too. 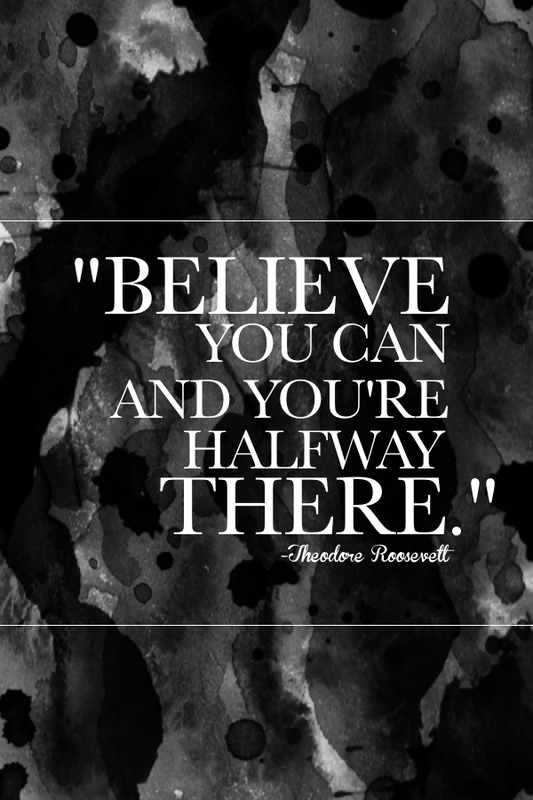 You’ll need them at the very end. 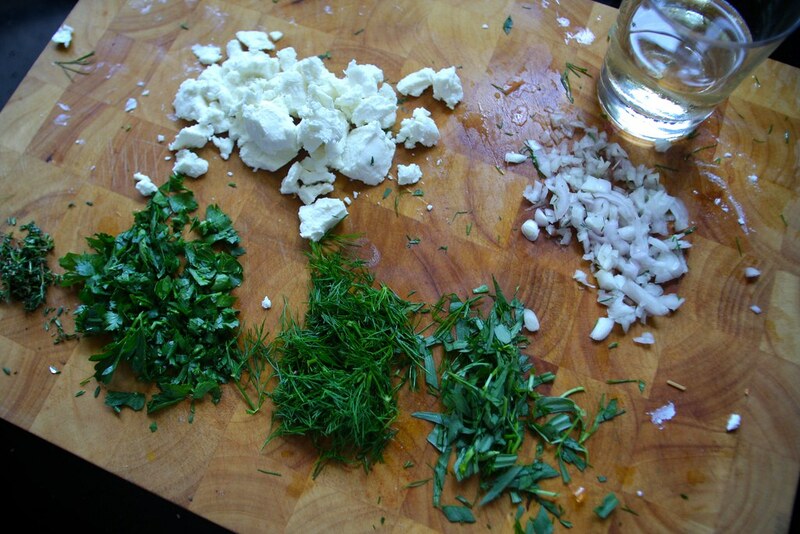 Add the goat cheese crumbles into your serving bowl/dish. 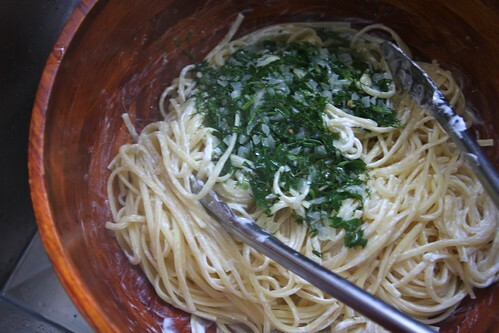 Once the wine has cooked down a bit, add the herbs with some reserved pasta water. Stir! Your linguine is done! Time to put it in the bowl where the goat cheese crumbles are resting. Mix the pasta with the goat cheese. Now add the herb butter sauce on top. 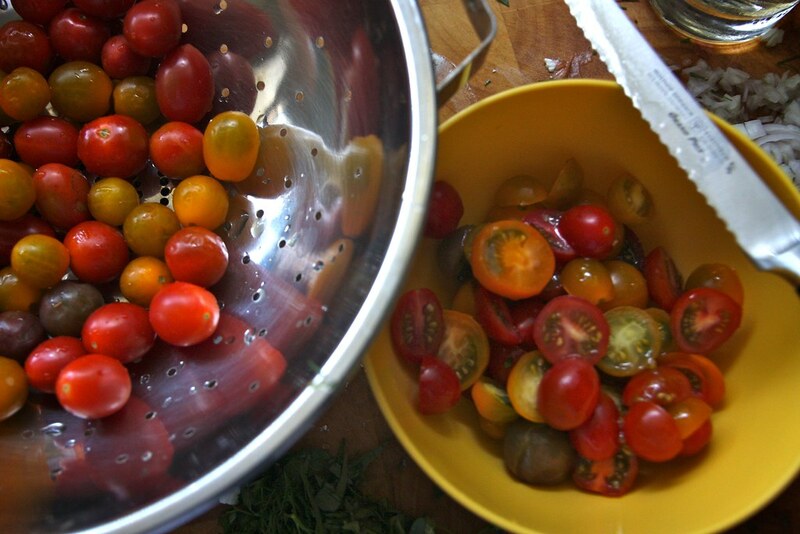 Throw in those freshly cut heirloom tomatoes! Give it another good stir. Top with some salt & pepper. Now it’s time to dig in!! Casey broke out a 2008 Banshee Santa Lucia Highlands Pinot Noir to drink with our pasta. 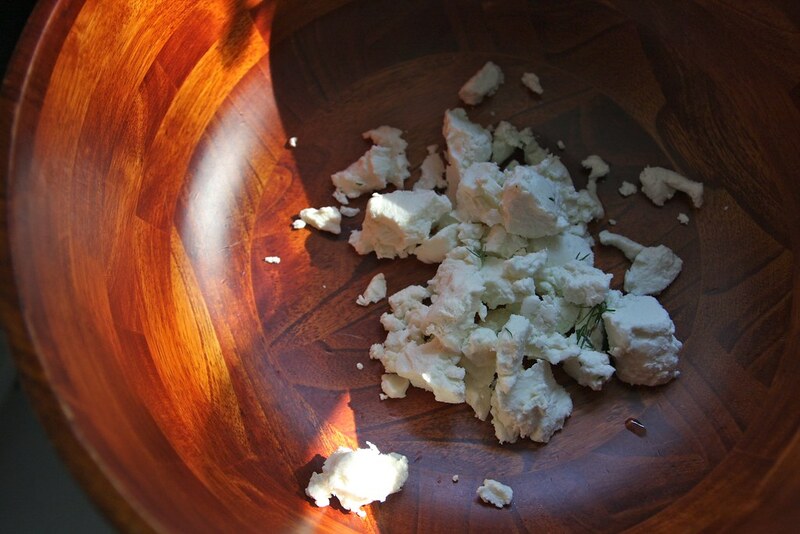 While the pasta is working, in a serving bowl, add the crumbled goat cheese. 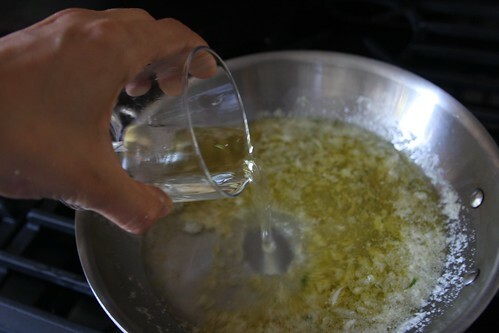 In a medium size saucepan, melt the butter over medium-low heat. Add the shallots and cook until softened, about 5 minutes. Stir in the white wine and cook until slightly reduced, about 2 minutes. Add the parsley, dill, tarragon and thyme. 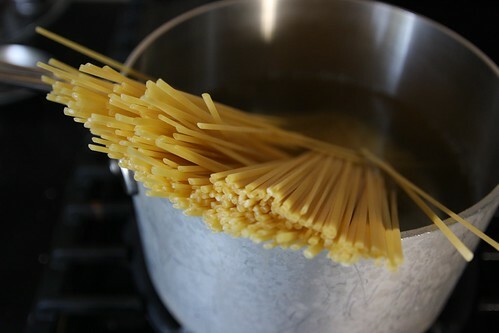 Stir in the reserved pasta cooking water. omg irish butter – isn’t it the best thing ever?! too bad they’re a wee bit pricey (for the size) but I love how creamy it is! I am so making this! Thanks, Tracy! when my mouth dreams of dinner, this is what it consists of. yum. i love you! plus, the photos are soo beautiful! 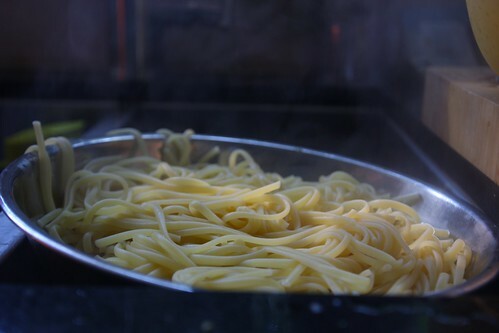 esp the steam rising off the pasta. 😉 !! Looks just about perfect to me. 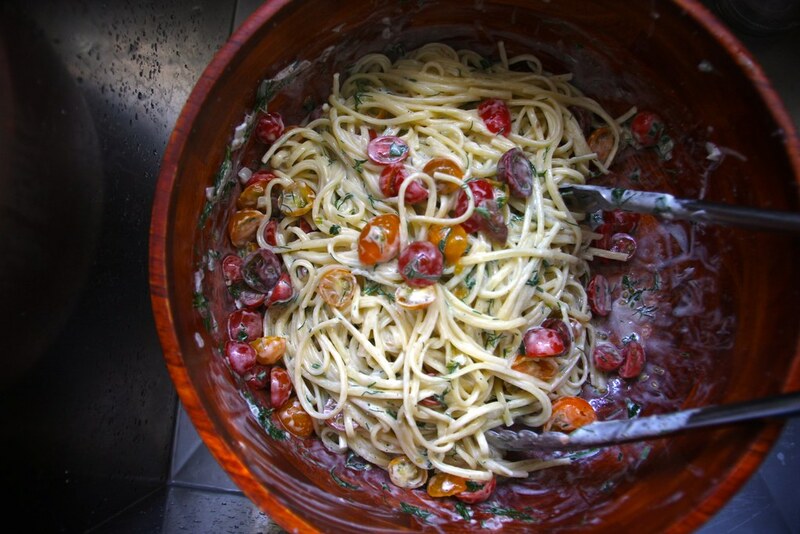 I LOVE the way goat cheese goes all melty in pasta. This is the essence of simple cooking and it doesn’t get much better than that. Holly cow, that looks amazing! This looks way too good. I love goat cheese! Can’t wait to try. This sounds fantastic! 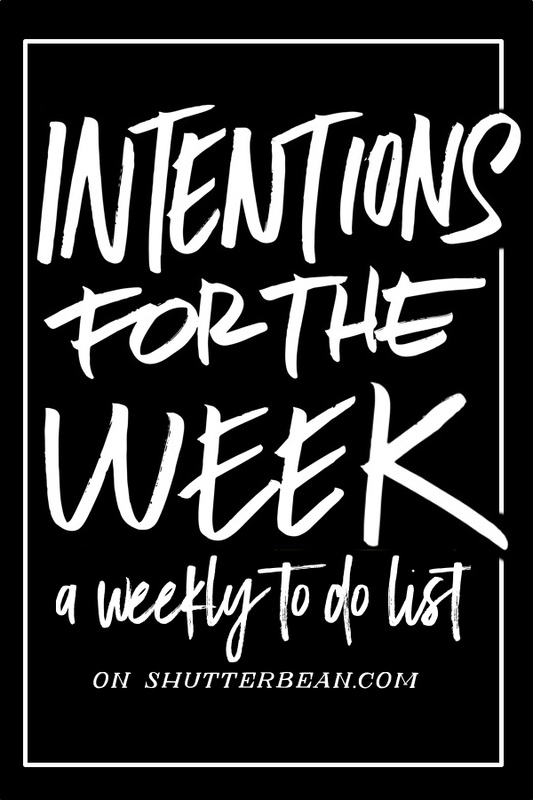 I was looking for something to round out my meal planning this week, and I think this will have to be it. What a great combination of summer ingredients. This is FAN-TAS-TICO! I just starting eating/loving/hearting goat cheese. This one is on the list to try too! Thanks Tracy.. Love the variety of recipes in your blog. This is awesome! First time making one of your recipes, and I will have to make more!!! Delicious. I never thought of using goat cheese with the veggies. What a great idea-looks wonderful! Okay, I’ve bookmarked *two* of your recipes *just this week. * Wow. Will be making this beautiful stuff the very moment my Sweet 1000’s ripen (in Holland, this may not be till end of August). Thanks bunches! Keep up the wonderful food blogging. 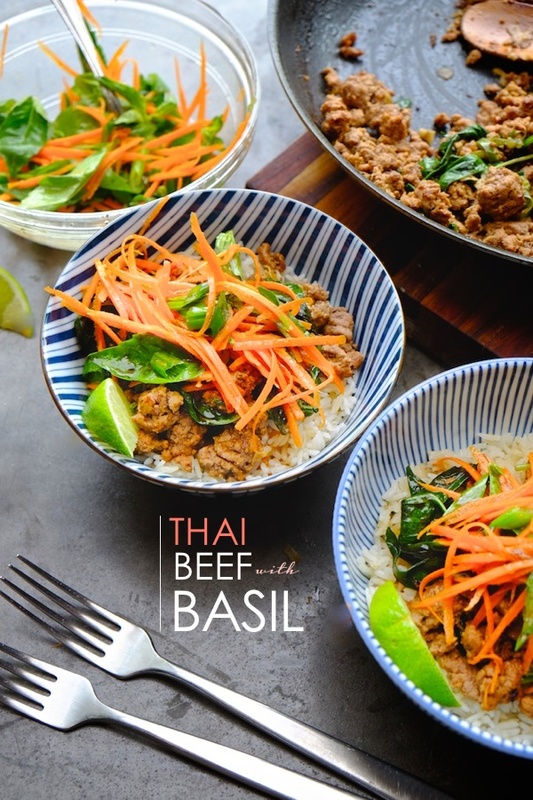 Just reading the title of this had me salivating… cannot wait to try!!! Glad you are ignoring Cooper’s hate on for pasta and you are posting pasta recipes! 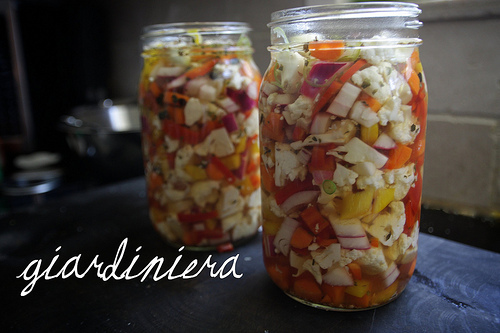 This looks AMAZING… cant wait to make it and it uses all of the herbs growing my garden! woot! Ahh this one is an oldie BUUUUUUUUUUUUUUUUUUT I’m gonna make it this week. oh shoot- well I am SO glad I saw it cause I am ALL over this this weekend- looks so delish. 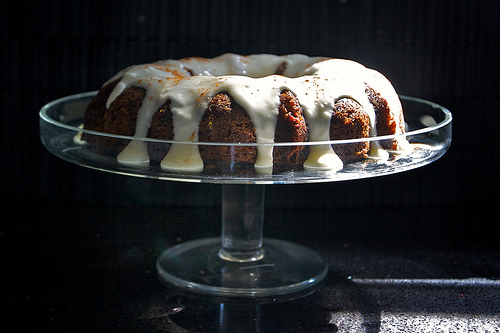 you totes should make this again. This looks SO GOOD! 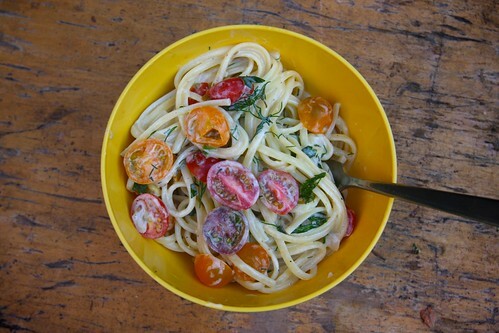 Totes using fresh tomatoes from my garden. Thanks Tracy! you’ll find it maj. TOTES!